You are here: Home / Jyotish Gemstones and Talismans / Scintillating Oval Ceylon Yellow Sapphire from Sri Lanka set in 22 KDM Gold ring. 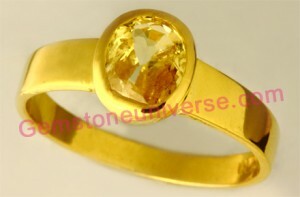 The Golden Yellow Color and the nearly eye clean nature of this gemstone make it very rare. Yellow Sapphire/Pukhraj-The gemstone of the pure planet Jupiter/Brihaspati-The planet of Good luck, wealth and divine knowledge!